Bruce Wrobel, the chief executive of Herakles Farms, claims his companys efforts to flatten a chunk of Cameroons dense rainforest to develop a palm oil plantation are borne of a desire to address a “dire humanitarian need”. Yet this week Herakles has had to suspend its activities in Cameroon following a forestry ministry order for the company to halt clearing work at their Talangaye nursery in the southwest region of the country. Greenpeace has long been among those calling out Wrobel and his company over their failure to tell the real truth over their project.The suspension of work is merely the latest evidence that the proposed plantation is a mess, despite the companys ever-present PR machine. In contravention of national law, in the face of local opposition and a huge threat to the local environment, the development is simply the wrong project in the wrong place and it needs to be stopped. Today, together with theOakland Institutewe have released a new report revealing just how big the discrepancy is between what Wrobel and his friends say publicly and what they are saying to potential investors. Compiled through confidential internal Herakles documents, here some of the biggest fibs exposed inHerakles Exposed. 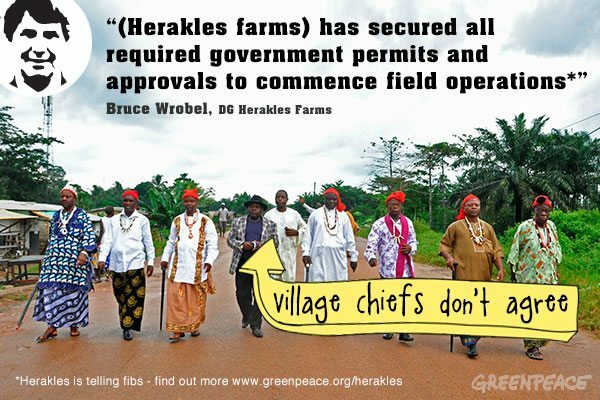 The reality:Herakles has yet to receive a land lease from the Cameroonian government and thus possesses no right to develop its concession area. It has been in violation of national law since 2010. The new order from the forestry ministry again proves Herakles has far from all the permissions required. The claim:Herakles does not tolerate corruption. The reality:Evidence strongly suggests Herakles has resorted to bribery, the offer of cash gifts and promises of employment to obtain the consent of some local communities and the government to facilitate the project. The claim:In a widely circulated open letter of 2012 by Herakles CEO Bruce Wrobel, the company claimed that all timber generated by the projects massive deforestation would benefit the Cameroonian government. The reality:In direct contradiction to Wrobels public claim, however, Herakles presentations intended to attract investors has estimated the company may bank US$60 – US$90 million on the sale of timber and brags about the “profit uplift”. We feel sorry for financiers that have been tempted by Herakles profit projections because Cameroonian law states that only accredited logging companies can commercialise timber. 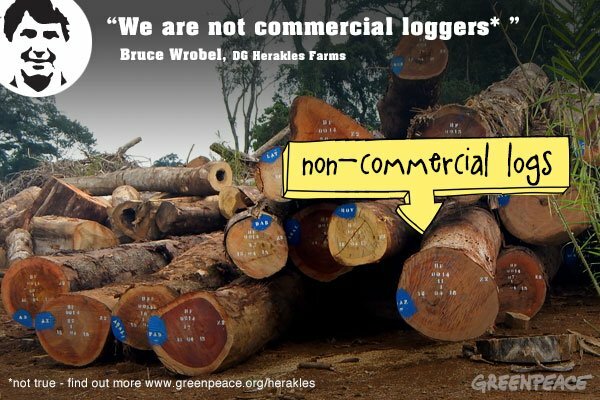 And as Wrobel himself wrote, Herakles “are not commercial loggers”. The claim:Herakles will produce 34 tonnes of palm bunches (FFB) per hectare at peak production. The reality:The most experienced palm producers in Africa yield 26 tonnes FFB per hectare and most plantations yield less than 20 tonnes FFB at peak production. 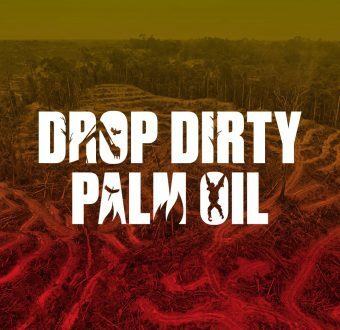 The reality:The company promises in an investment advisory it would clear more than 10,000 hectares of land in order to plant 1.5 million oil palm seedlings. However, internal communications from employees reveal Herakles is in no position to clear that much land and that the seedlings and nursery are already overgrown by nine months, meaning work is unable to proceed at the advertised speed. Okay, so Herakles is not the first American or international company to employ questionable business practices abroad so why does it matter so much? Since 2008 there has been a massive land rush on the African continentas foreign companies and governments look to produce commodities, biofuels, and food staples in addition to asserting foreign control over natural resources such as timber, minerals and water. The heavily forested areas of the Congo Basin are prime targets as companies search for rich soil in areas with a low population density. If Herakles project succeeds despite the illegalities, the massive deforestation, destruction of local livelihoods and false claims to investors many other investors may attempt to do the same. That is why the project must be stopped permanently. 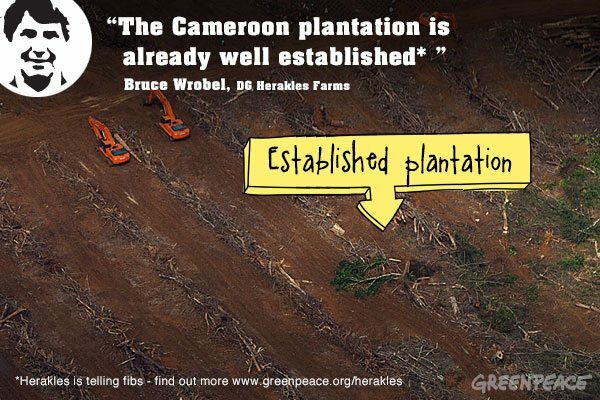 Tell Herackles Farms CEO that you the palm oil project in Cameroon is not sustainable development.